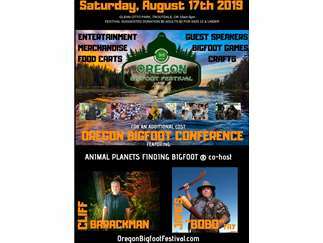 The 3rd annual Oregon Bigfoot Festival will be held Saturday, August 17th, 2019 at beautiful Glenn Otto Park in the wonderful town of Troutdale Oregon. The festival hours are 10am-5pm. We ask a $5 suggested donation admission for adults and $2 for kids 12 and under. Please, no pets allowed or outside food and drinks. Cost: $5.00 suggested donation for adults $2 for kids 12 & under.